Other Half returns home last night bearing coffee. I decide to put it in a little-used bottom cabinet which contains old dish towels and burned oven mitts. Slide open drawer. Fat mouse runs along the drawer ridge and disappears in back of drawer. Scream and commence the Mouse Dance. (modified version of the Rat Dance) As I jump up and down, point and scream, Other Half (who has been law man for 30 years) also begins to scream and jump in place. 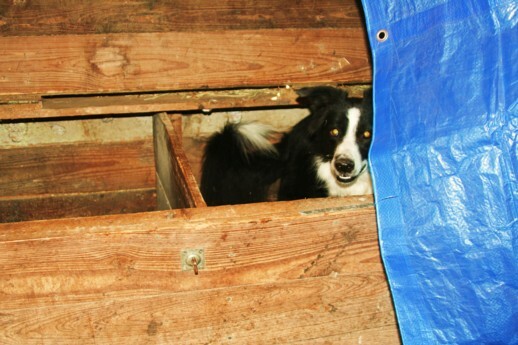 I yell for my Contract Killer - aka Lily the Border Collie, who is fearsome confused by all the excitement. I clarify to Other Half that the suspect is a mouse, not a snake, (he was certain I had found a snake) and point Contract Killer toward drawer. She begins her search for Trespassing Rodent but has no luck. Stewart Little the Mouse has crawled out of the drawer and into the back cabinet. I slowly open drawer above the bottom drawer. A tiny mouse stares up at me. I scream. Contract killer cannot get to mouse before Stewart Little's Little Friend scampers off. Other Half shouts at me to cease shrieking when I am surprised by a rodent because "it scares the crap out of him." I am beside myself. Two mice in less than two minutes! Contract Killer and I now begin a diligent search for mice in the kitchen. As I slowly open cabinet doors, she scans the contents like a Raptor, searching for her prey. Our systematic search of the kitchen is fruitless. We clean out the cabinets and Other Half baits mouse traps with peanut butter. I inform him that the cats at my For Sale House are coming here! NOW! (They are still living in the barn at the other house until it sells. It's under contract now. Keep your fingers crossed.) Other Half informs me that he does NOT want house cats. They are dirty. They come with litter boxes. He does not like cats in the house. I remind him that I don't like RODENTS in the house. He continues to set mouse traps. I state that I will NOT set mouse traps, nor will I empty mouse traps of deceased rodents - that is NOT in my job description. Other Half informs me that I am over-reacting to the idea of mice in the kitchen. After all, it's just a little mouse. They've probably been crawling all through the cabinets and we haven't died yet. I am not amused. I return from the walk to find Other Half standing in the kitchen re-setting traps with peanut butter. My gaze happens to land on the kitchen sink. There is a stiff dead blond mouse splayed out in a trap on my kitchen sink. I begin screaming and shouting at him. He fails to grasp the problem. (MEN!) At this point I am ready to have an apoplectic fit. I order him to remove said mouse from my sink and disinfect the entire sink and counter. He agrees but argues, "it's just a mouse." Am I alone in this? Am I a voice crying out in the wilderness? Does anyone else have a problem with a freakin' mouse on the kitchen sink??!!! If I had not SEEN the Rigor Mortis Rat (okay, it was a mouse) on the sink, would he even have bothered to clean it?!!! EEEWWW!!!! "The only good mouse is a dead mouse!" Yup bad when dead ones are presented regularly as my breakfast treat sometimes afternoon tea. Son in Law rescued an alley cat kitten when he first came here from Boston. This cat has grown into a lethal hunter of very large proportions. I can handle the regular dead ones but in recent times he is making it interesting with a live one or 4. They are what we refer to as bush rats a native marsupial. Reasonably large, also field mice these he half eats and precioius sugar gliders (type of possum). You are NOT wrong! I freak out when my husband washes his filthy hands in the kitchen sink where I place dishes. There is a reason why we have a bathroom sink. A mouse is off the radar. (in any sink). I must add a word or two in a non-sexist frame of mind. I wouldn't care if the mouse ended up in the sink or not (I have a dishpan for washing dishes) as long as the darn thing was dead. The sink can always be cleaned. I haven't seen "my" gray house mouse since the evening it was in my bedroom, watched at a distance by my cat and ignored by Terri. Where did it go? Does it have relatives lurking in my attic? OK, I have to confess that climbing up to peer through the hole in the ceiling is something I just don't want to do. Put it down as one of my fears -- a fear of the possibly disease-ridden musty-dusty unknown. Wish I had a brave southern gentleman to seach my attic! Never thought of using vac, but I have Rainbow so mouse would drown, [bo ho] I have lived with mice in my camp at the lake for years, they get the message to vacate just as soon as my BC Augie walked in the door. NOW RATS are a different story and I have killed quite a few by stomping cause DOGS just wanted to play with them. Thats the difference between BC and Rottys, one knows the duty of a dog and the other thinks they are play toys. I won't tell ya'all what my first hubby said about mice, not enough *** on my keyboard.